Rx Racing Honda B-series Street Demon 485HP Package. Packing List of Included Kit Items. Brand new Street Demon Series turbo package for B16/B18/B20 Honda powered vehicles. 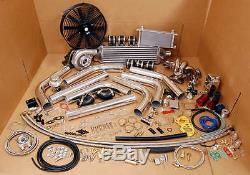 The most complete turbo package available for B-engine Hondas. This package has all new quality parts that are capable of producing well beyond 485 horsepower at 25+ PSI with supporting modifications and a built motor. This is the most complete package available compared to others at an affordable price. On a stock motor the kit will create give the motor a 100 horsepower gain on a low boost setting of 8 PSI. Includes a cooling solution for a hot turbocharged engine. Also, the included electronic turbo timer provides a hassle-free operation of precisely calculating the cool down period to ensure a proper cool down for your turbocharged motor. Works with either automatic or manual gear boxes. The turbocharger connects the exhaust via down pipe that might be required. Lastly, this kit keeps your air conditioning and power steering for a great street setup. 57 compressor wheel trim mapped for low & high boost setups. Oil fitting gaskets & mounting studs included. Capable of producing over 450 horsepower. Wet float bearings & properly balanced. 3" inlet diameter with a 2" outlet. TIG welded 321 Stainless steel material for longevity & strength. High quality tubular piping with large primaries. Strong design supports the weight of the turbo. High quality gaskets included for all flanges. Full install kit includes all bolts & hardware. Extra thick flange support the turbo well. Beautifully polished for a show finish. High quality T3 turbocharger flange. Fully ported and polished design. Large design cools down the turbocharged air efficiently. Strong TIG welds will support high PSI levels. Extra thick core provides ample cooling. 2.5" cold outlet & 2.5" hot inlet. Less then 2% pressure drop. (1) Turbo Oil Line Install Package. T fittings will fit almost any motor & still use factory oil pressure sending unit. Necessary fittings and clamps for a complete installation. 18 inch 5/8 high temperature 550psi oil return line. Premium gaskets & hardware for the turbocharger. 77 inch straight high strength oil feed line. Strong "T" fitting to hook up to block. Superior quality lasts a lifetime. High quality oil feed fittings. High quality turbo oil drain. Brand new turbo install kit. (1) Universal Intercooler Piping Kit. Lightweight yet strong aluminum piping. May necessitate light modification to fit. (16) stainless steel worm gear clamps. (2) 2.5 90 degree silicone couplers. (6) 2.5 straight silicone couplers. (2) 90 degree 2.5 bends. (2) 60 degree 2.5 bends. (2) 45 degree 2.5 bends. (2) straight 2.5 pipes. Can be setup to adjust boost PSI on the fly. Can be adjusted for any PSI level desired. Protects turbo by venting when shifting and/or reducing throttle. Performance design produces a powerful & aggressive sound. Quality design will not leak under high boost conditions. Flanges installed at user discretion. Fan can be used to cool: A/C condenser, oil or transmission cooler, mounting on an intercooler to prevent heat soak, or cooling a a2w radiator. Slim design provides excellent engine bay clearance. Includes the mounting tabs for a easy zip tie install. Reversible design can either pull or push air. Versatility of a push/pull reversible fan. Superior flow of a curved-blade design. 1.25 thick outside perimeter. 2.50 thick inside perimeter. Ensures a proper cool down for your turbocharged car every time. Includes pigtail wiring and extra wiring for ease of installation. Important to preventing premature turbo wear and failure. Mounted inside the vehicle for on the fly adjustments. Precisely calculates the cool down period for the motor. Auto mode feature creates a hassle-free operation. Ensures better mileage & better performance. Removes oil vapors from breather line. Show like high quality polish. If the engine already features a factory oil cooler, this oil kit can still be used together with the OEM cooler kit. Cooler core has 15 rows which is perfect for cooling hot engine oil(a cooler that is larger will not be efficient). Plate features 1/8 NPT ports for oil pressure & temperate sensors for gauges or for turbo oil feed lines. Cooler can be mounted in direct airflow or hidden & it will still do its job of cooling. Oil Line fittings are machine crimped & checked to prevent leaks. Cooler features 4 strong brackets for a sturdy & easy installation. (2) Stainless steel lines feature aluminum racing swivel fittings. Bar & fin core design is very effective at cooling hot engine oil. 7/8 Oil lines are fully reinforced with braided stainless steel. Oil lines resist engine bay heat & can support over 200 PSI. Oil lines are high quality & 4.4 ft.
Cooler measures 13 long x 5.5 wide x 2 thick. Cools hot engine oil by over 20 degrees. CNC milled billet aluminum oil plate. Oil filter adapter has 1.5mm threads. Oil cooler is lightweight aluminum. (1) Billet Aluminum High Flow Fuel Filter. CNC machined T6-6061 billet aluminum construction. High flow capacity for demanding fuel systems. Strong brackets for easy mounting. Protect the turbo system from over boosting by venting surges. Includes complete install kit featuring gaskets and flanges. Strong construction provides years of reliable service. Monitor the water temperature via this sensor relocator. Easy solution to run aftermarket coolant sensor. Provides more precise readings then the stock location. Features 2 installation clamps for an easy add on. 38mm ends fits most OEM coolant hoses. Fits the following vehicles with specified engine. Any vehicle running a B16/B18/B20 swap (Civic, Integra, CRX, Accord, Del Sol etc). 96-03 B15 City VTEC / Non VTEC. 89-92 B16A Civic SiR JDM. 90-93 B16A Integra RSi/XSi JDM. 92-95 B16A Civic SiR II JDM. 89-92 B16A1 Civic VT EDM. 90-91 B16A1 Civic SiR JDM. 91-95 B16A2 Civic Vti EDM. 99-00 B16A2 Civic Si USDM. 94-97 B16A3 Del Sol VTEC USDM. 94-97 B16A3 Del Sol Vti-T EDM. 96-00 B16A4 Civic SiR II JDM. 97-01 B16B Civic Type-R JDM TYPE R. 92-93 B17A1 Integra GS-R USDM. 94-95 B18C Integra Si VTEC JDM. 95-99 B18C Integra SiR-G JDM. 96-00 B18C Integra Type R JDM. 94-01 B18C1 Integra GS-R USDM. 96-97 B18C3 Integra Type R Taiwan/Hong Kong. 96 B18C3 Civic VTi 1.8. 97+ B18C4 Civic 1.8 Vti EDM. 97-98 B18C5 Integra Type R USDM. 00-01 B18C5 Integra Type R USDM. 96+ B18C6 Integra Type R EDM. 96+ B18C7 Integra Type R Australia. 87-89 B20 Accord 2.0i EDM. 85-87 B20A1 Prelude Fi EDM. 86+ B20A1 Prelude 2.0i EDM. 87+ B20A2 Accord 2.0i EX EDM. 90-91 B20A3 Prelude 2.0 S USDM. 88+ B20A4 Prelude 2.0. 90-91 B20A5 Prelude 2.0 Si USDM. 88-89 B20A5 Prelude Si USDM. 87-92 B20A7 Prelude 2.0i EDM. 88+ B20A8 Accord 2.0i EDM. 87-92 B20A9 Prelude 4WS 2.0i EDM. 97+ B20B3 CR-V RD1 EDM. 90-91 B21A1 Prelude Si USDM. Eworld is not happy until the customer is 100% satisfied. Please make sure that the part you ordered fits before altering or final installation. Altered items and custom orders are not refundable or returnable. Due to manufacture supply, colors/styles may be slightly different. The item "485hp Honda B B16 B18 B20 Civic Turbo Kit Type-R NEW Integra CRX ACCORD DEL SOL" is in sale since Monday, October 22, 2012. This item is in the category "eBay Motors\Parts & Accessories\Car & Truck Parts\Turbos, Nitrous, Superchargers\Turbo Chargers & Parts". The seller is "eworldsales1" and is located in Troy, Michigan. This item can be shipped to North, South, or Latin America, all countries in Europe, all countries in continental Asia, Australia, South africa, New Zealand.